Hybrid bearings can prolong the service life of electrical motors, machine tools, fluid machinery, etc., where the operating conditions may include electrical-current passage, high speed, contamination or poor lubrication. A frequency converter is an important addition to an electrical motor. It simplifies design and control for variable speeds, reduces power consumption and enables high-speed designs. Frequency converters, however, have caused an increase in electrical damage of bearings. This includes washboard pattern, micro-cratering and pitting to raceways, graying to rolling elements and blackening to greases. Such damage is caused by electrical discharges in the raceway-rolling element contact. Discharges arise because the common mode voltage differs from zero and edge spikes are formed, due to very short switching times. Also, other causes of electrical damage may occur. In hybrid bearings, the ceramic rolling elements of silicon nitride are electrical insulators. For DC current, the open hybrid bearing, without seals or shields, is an insulator in the order of several GΩ resistance. The hybrid bearing becomes a very effective tool for breaking DC current paths through the rolling element-raceway contact. Furthermore, and most importantly, under high-frequency currents, the ceramic rolling elements of a hybrid bearing act as a dielectric between the inner and outer rings. The capacitance of hybrid bearing is very low (in the order of picoFarads). Due to the relatively large diameter of the rolling elements, the small size of the raceway contacts and the low relative dielectric constant, εr, of the silicon nitride gives impedances of above 1 kΩ, even at frequencies of 1 MHz. Thus, the hybrid becomes an extremely effective tool against electrical damage to bearings, particularly in respect to high-frequency currents. 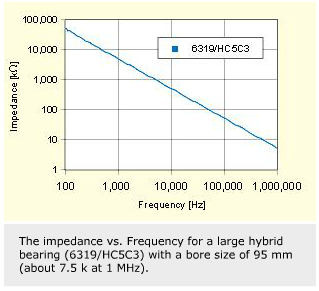 The increasing use of frequency converters enables simpler designs of high-speed electrical motors for either increased output of power or speed. For correct operation, the bearings used need a combination of high-speed capability, appropriate grease-life and electrical insulating properties. 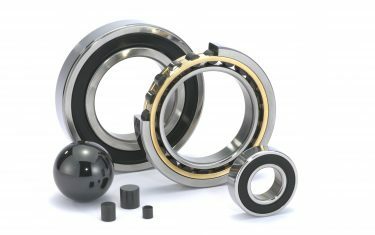 Sealed greased-for-life hybrid bearings offer this combination, as well as easy handling in the production environment. At high speeds, the ceramic balls will give superior grease life, create less bearing friction due to lower centrifugal forces and make the bearings resistant against skidding damage at light loads. Potentially, these bearings also need to offer good service life in vertical shaft positions. It is advisable for greased-for-life deep groove ball bearings to use polymeric cages under high-speed and high-acceleration conditions. One example is the glass fiber reinforced polyamide cage. A high-performance alternative is to use a glass fiber reinforced polyetheretherketone (PEEK) cage. PEEK has the advantage of being stiffer at higher temperatures. This causes less risk of bulging and deformation. Furthermore, PEEK’s temperature and chemical resistance make it less sensitive to high temperatures in the ball-to-cage contact. 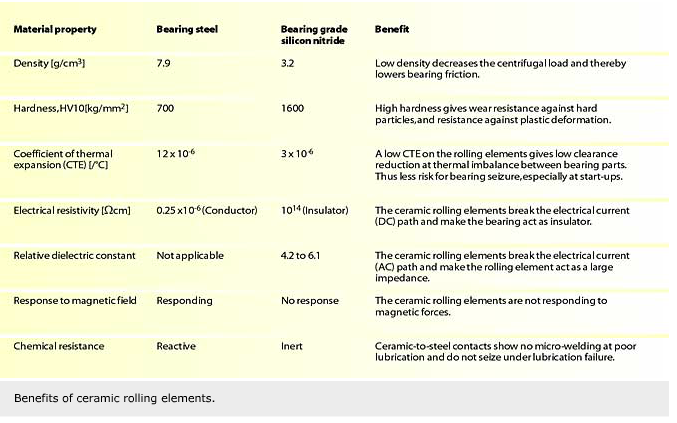 The grease life is longer for hybrid bearings than for all-steel bearings. Moreover, all-steel bearings subjected to electrical current passage will see an additional reduction in grease life. Generally, the grease life for hybrids is more than four times as long at very high speeds than the grease life for all-steel bearings. In some cases, however, as under extremely high speeds, grease life is even much higher. The basic grease life needs to be established for the specific grease after which calculations can be done to estimate the life for the specific running conditions. Basic grease-life data are established for hybrids by using SKF ROF grease-life testing equipment. The SKF wide temperature grease (WT) is most suitable for electrical motor applications because it offers long grease-life at high temperatures and very high speeds. A combination of the surrounding temperature, current losses in stator and rotor, iron losses, stray losses and bearing friction set a higher working temperature in an electrical motor. The greased-for-life service range shows a very long grease life over the 70 °C to 120 °C temperature range. Vibrations can cause problems for rolling bearings under standstill, due to poor lubrication. In some applications, electrical equipment experiences severe vibrations. Examples include various backup or temporary working equipment in process industries and transport systems such as in trains and ships. The visible sign is false Brinelling marks on the raceways that cause vibrations. Also, equipment working under oscillating conditions, such as stepping motors in certain applications, is prone to false Brinelling after prolonged continuous use. These problems can often be overcome by using a good engineering design and appropriate lubrication. 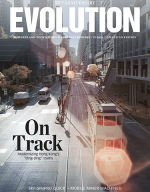 For severe cases, a better performing alternative may be needed. 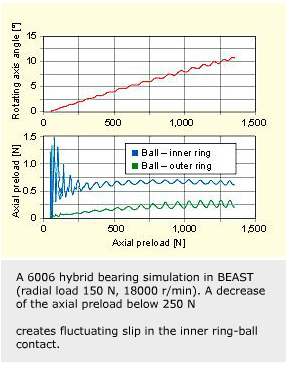 Hybrid bearings offer such an alternative, because of their ability to withstand the poor lubrication encountered under vibrations at standstill. SKF Ceramic Bearings keeps a service stock of hybrid bearings for the electrical machinery market. The typical execution is a deep groove ball bearing in the 60-, 62- and 63-series with bore sizes of 10 to 45 mm. The bearings are equipped with low-friction seals (2RZ), a glass fiber reinforced polyamide cage (TN9), ceramic balls (HC5), clearance greater than normal (C3) and a wide temperature grease (WT) with high-performance characteristics for electrical motors. A typical bearing design designation is 6205-2RZTN9/HC5C3WT. This bearing design combines electrical insulation of the raceway contact, high-speed capability and superior grease life at high speeds and high temperatures. The service range is suitable for standard-sized electrical motors in the 0.15 to 15 kW range, as well as other electrical machines such as generators, power tools, etc. 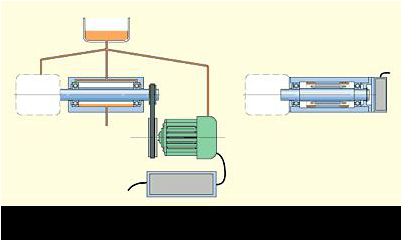 The hybrids are typically applied to insulate the non-drive end side of a standard motor. It should be noted that features such as properly grounded motors and symmetrical and shielded cabling also reduce the problems. Also, certain electrical problems may need insulation of both bearings. It should be stressed that the original equipment manufacturer should always be contacted about design changes of electrical equipment. The SKF INSOCOATTM solution is used for shaft sizes from 55 mm and above for electric current problems. Its high-performing ceramic coating on the outer ring of the bearings is a very effective protection against most prevailing electric current problems. 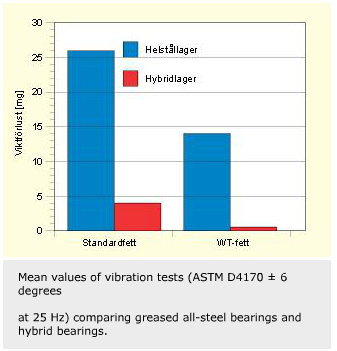 However, some larger deep groove ball bearings, shaft sizes up to 110 mm, are available in hybrid versions (HC5) from stock to satisfy some very special needs – for example, designs working under extreme current frequencies, severe vibrations, contamination, etc. 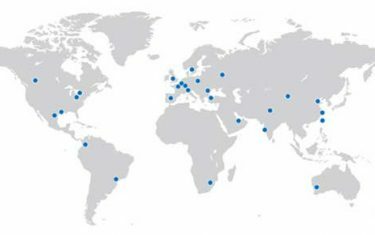 The SKF business unit Machinery Specials (MSP) has extensive experience in demanding electrical applications and the development of customer specific bearing designs and units. MSP has, for example, recently developed greased-for-life traction-motor bearing units (TMBU), incorporating hybrid bearings. These units fulfill very demanding customer specifications for a greased-for-life design and electrical insulating properties combined with simple handling and application of the units. Additional advantages are the downsizing potential for traction motors and high-speed capability. Recently, these TMBUs equipped with hybrid bearings helped one SKF customer win a large contract for traction motors. 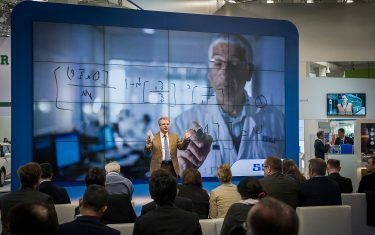 To summarize, SKF is well equipped to assist various electrical-machinery customers in their upgrading of existing products and designing of new ones. 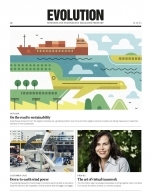 SKF supports this development by creating design guidelines for hybrid bearings and through availability of supply. 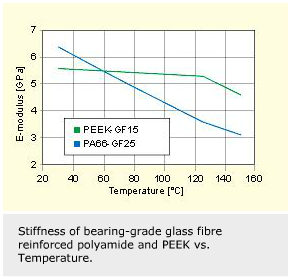 Various greased-for-life hybrid bearing designs and hybrid bearing units will play important roles in this development, which is seen due to increasing need for electrical insulation, greased-for-life products, higher speeds and higher power density. Demands for such products are forecast to increase because they offer ease of maintenance, high performance and easy applicability.